Welcome to Your One Stop Shop for All Your Party Equipment Rental Needs! Check out our discounted PARTY PACKAGES! Our Party Packages are great for any celebration! 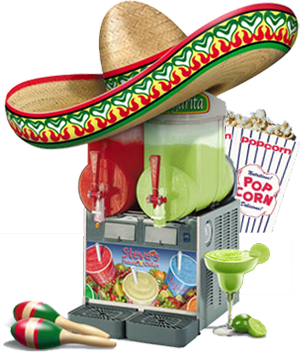 * Concessions that qualify for any of our party packages are: popcorn machine, cotton candy machine, snow cone machine, nacho Cheese dispenser or a hot dog machine. ** Tables & chairs that come with our party packages are the 6' rectangular tables and metal folding chairs. We can substitute them for kiddie tables and chairs upon customer's request.